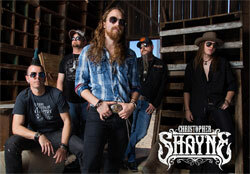 Christopher Shayne is no stranger to the desperado way of life. He’s always stuck true to the ideology of doing what you want, whenever you want, wherever you want, while sticking it to the man. As the former driving force behind Phoenix based band Whiskey Six, Shayne was able to seamlessly perfect his songwriting and guide the band to embrace their unique take on southwestern rock music. After a successful run with Whiskey Six, Shayne had a desire to create something new, and construct his desired blend of classic southern and blues influenced rock, complete with modern tones and contemporary twists. Wanting to stay true to his band, Christopher Shayne composed a 12-track record with former Whiskey Six lead guitar-slinger Dave Lansing entitled Turning Stones. Shayne’s latest rocker is “Burn Me Down,” an explosive toe-curler that encapsulates everything he’s about. “Burn Me Down” tells the story of the general dissatisfaction with growing up and the harsh reality of how the world really is. No matter your social status, you will always face this hard and cold truth at some point of your life, need to be ready to do battle, and happily step down onto the elbow thrashing level of reality. He goes a step further to call out the music industry and share his personal story of what artists and musicians go through daily to fight their good fight. Shayne has never been afraid of pushing the envelope, in fact, he literally shreds it. An intense illustration of personal moments of hardship, rebellion, and triumph is what viewers can expect upon their first viewing of the “Burn Me Down” music video. Entering real life scenarios that people far and wide face, bring to fruition the disillusion of life that many people have. The personal rebellion against expectation increases as the video progresses, and our protagonists become more and more defiant of today’s societal norms. Although “Burn Me Down” highlights many negatives and hardships that life can bring you, Shayne wants to emphasize that working through your tough times with a carefree spirit will make everything worthwhile. Here at HIP, we’re profoundly thrilled to share with you a glimpse of Outlaw Rocker Christopher Shayne, with his new music video for “Burn Me Down.” We are certain that your viewers will flock to “Burn Me Down” and connect with it on a deep emotional level. Rest assured we’ll have plenty of outstanding Christopher Shayne merch to set up online/on-air contests and giveaways throughout the campaign, so please reach out to us if you’d to get your hands on some. For more info on Christopher Shayne please contact Andy Gesner and the HIP Video Promo team at (732)-613-1779 or email us at info@HIPVideoPromo.com. You can also visit www.ChristopherShayneMusic.com for more information on Christopher Shayne.